Boulder Mail Trail parking (start): 6,760 ft.
Boulder Mail Trailhead: 6,640 ft.
Death Hollow - Escalante junction: 5,380 ft.
Escalante River Trailhead: 5,200 ft. Trail: There is no reliable trail for most of this hike, however the route is very easy to follow. You will be walking through water much of the time, so wear wettable shoes. It may be necessary to float your backpack across a pool of water in one or two places, so you should also carry an air mattress and a watertight river bag to keep your gear dry. Also, you may occasionally have to walk through thick undergrowth, so wear long pants. Season: Summer, early fall. You will be spending a great deal of time in the water on this hike, so it should be done in warm weather. The best time is from mid-June through September. Flash floods are possible, especially at the end of summer, so stay out of the canyon if it looks like rain. There is also a great deal of water in Death Hollow during the spring runoff from mid-May to mid-June. It is still possible to go through the canyon at this time, but you may have to do some swimming to get past the obstacles. Do you have any recent information to add about this trail? This is one of those special hikes that has something for almost everyone. The first part of the route follows the old Boulder Mail Trail, a historical trail characterized by wide vistas of slickrock desert with stunning views into Sand Creek Canyon and Death Hollow. The second part of the trail descends through the lower half of Death Hollow, a deep, wild, and watery canyon with scenery that is often spectacular. Finally, the trail leaves Death Hollow to follow a more serene section of the Escalante River, past two natural arches and an Anasazi cliff dwelling, to the trailhead near Calf Creek. The first and last sections of the hike are easy, and can be done at almost anytime of the year. In Death Hollow, however, you will be walking in the streambed much of the time, and the difficulty is strongly dependent on how much water is present. Most of the year the water is never more than knee deep, but in some months hikers may have to swim to get across some of the pools. To be safe you should carry a river bag and an air mattress-just in case you have to float your pack across an unexpected pool of water. 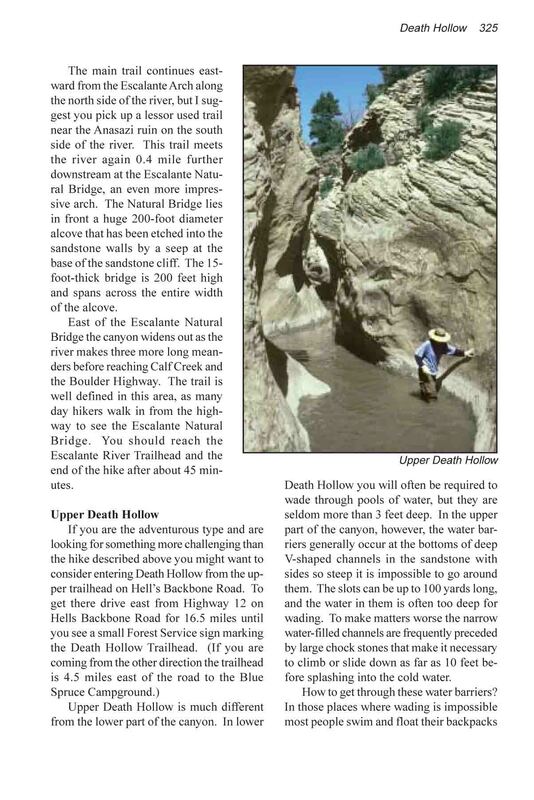 The worst time to hike through Death Hollow is during the spring runoff from mid-May through mid-June, when the creek is often flowing at 3-4 times its normal volume. There can also be problems in August, the month that receives the most rain. Never venture into the canyon if it looks like rain, since there is an ever-present danger of flash floods. But the flow rate usually drops off quickly, so if it has not rained for a few days you can generally expect good conditions. After leaving the road the trail winds across the McGath Point Bench in a southwesterly direction. The vegetation is primarily pinion pine and juniper, although there is not enough soil to support much of a forest. Most of the route is over slickrock, and you must depend on cairns to show you the way. Initially the grade is level, but soon the trail starts downward as it begins its long descent into the Sand Creek drainage. The creek is located 1.8 miles from the trailhead. Sand Creek is a small perennial stream that runs through the bottom of a shallow, slickrock canyon. The trail crosses the creek soon after reaching it, and then follows its west side for 0.2 mile before climbing back to the top of the plateau. If you got off to a late start there are several good places to camp along the creek. After climbing out of Sand Creek Canyon the path begins a long meander over the top of Slickrock Saddle Bench. The Mail Trail was once an important communications link between the towns of Boulder and Escalante, and you can still see the remains of an old telegraph line that ran beside the trail linking the two towns. The line was built by the U.S. Forest Service in 1910, and it was still in use as recently as 1955. It consisted of a single galvanized iron wire, strung across the desert on poles and live trees. 2.5 miles after leaving Sand Creek you will come to a fork where the Bowington Trail departs on the left. This trail is occasionally used as an alternative route to the Escalante River for pack animals. Bear to the right at the fork, and within a few minutes you will see the ground open up in front of you as Death Hollow comes into view. Unlike the more mundane Sand Creek Canyon, Death Hollow forms a deep gorge in the slickrock plateau and the view from the top is dramatic. Just before you reach the canyon rim the trail turns sharply to the right and then begins its descent. Before going down, however, you should drop your pack and spend ten minutes enjoying the view from above. If you leave the trail just before it turns to start down (near a large ponderosa pine tree) and walk straight ahead for a hundred yards you will come to an overlook point where there is an especially fine view into Death Hollow. The route into Death Hollow follows a steep slickrock trail with about 640 feet of elevation loss. This section of the old Mail Trail must have been especially precarious for pack animals. It is said that the canyon received its name around the turn of the last century when a mule stumbled and fell into the gorge. Near the bottom the path passes by a large alcove that is a favorite campsite for backpackers. The alcove is located near the right side of the trail, about 100 feet above the canyon bottom. There is a large flat area in the back of the recess, big enough to accommodate a small group of campers, and the site is well sheltered from the weather. If you prefer to be nearer the water there are also several nice sites on the canyon floor, or if you decide to walk further downstream you will have no trouble finding good campsites along the entire length of Death Hollow. The 7.8 miles from the Boulder Mail Trail through Death Hollow to the Escalante River are the most exciting part of this hike. The hiker-made trail frequently plunges in and out of the streambed, dodging brush and boulders as it searches in vain for an easy way down the canyon. Occasionally you will encounter deep pools on the canyon floor, but there is usually an easy way around them. Under normal conditions you shouldn�t have to cross any pools that are more than knee deep. I have been in Death Hollow twice, and neither time did deep water present a serious obstacle to my progress. But I must add that conditions change from year to year in the canyon, and it is impossible to predict what one might encounter. Every few years a flash flood will roar down the gorge, washing all of the sand and rock from the potholes and turning shallow wading pools into deep swimming holes. So be prepared. Death Hollow is not a place you would want to be during a flash flood, so always check the weather before entering the canyon and stay out if it looks like rain. Flash floods are not particularly common, but there is ample evidence within the canyon to verify their existence (huge logs left stranded high above the streambed, flotsam stuck on the branches of trees). Most of the floods occur from mid-August to mid-September when there are more thunderstorms, so if you are hiking during these months be especially careful. Also, try to avoid Death Hollow during the spring runoff. If you are hiking in late spring I can almost guarantee that you will have problems with deep water. There is one more hazard in Death Hollow that should be mentioned: poison ivy. Poison Ivy is a bright green, usually shrubby plant that grows 2-3 feet high. Its leaves always grow at the ends of the stems in groups of three, and its pea-sized berries are yellowish white in color. For some reason there is a great abundance of poison ivy growing in the lower reaches of the canyon so be careful not to walk through it. About fifteen minutes after reaching the bottom of Death Hollow the trail passes by a cairn on the right that marks the exit point of the Boulder Mail Trail. The old telegraph line crosses the canyon a short distance upstream. You may have also noticed an abundance of black volcanic boulders that have washed down the canyon from an old eruption to the north. The insoluble basaltic boulders are not easily eroded by the stream and they just keep moving down the canyon with each new flash flood. They are present in all the canyons of the Escalante drainage. After 3.8 miles and countless stream crossings the trail passes by the mouth of Mamie Creek, roughly the halfway point of the hike. Below Mamie the canyon narrows in several places to a width of only 30 feet or less. The sandy bottom of the streambed is the easiest place to walk, but be on the lookout for quicksand. Quicksand most commonly occurs is places where the water is flowing very slowly or not at all, such as on the downstream side of a large boulder or other obstruction. It is not life threatening, but it can cause you to stumble and fall. About halfway between Mamie Creek junction and the Escalante River the canyon walls narrow around a fast flowing waterslide on the canyon floor. Sliding down the smooth sandstone chute can be a lot of fun, but getting a backpack around it presents a problem. It is usually possible to get past the waterslide by crawling along a narrow shelf at the edge of the water, but this is hard to do with a pack and if you slip you will slide in. Alternatively, you can carry your pack around the chute on a ledge above the creek and lower it back down with a short piece of rope. Or, if all else fails you can always just go down the waterslide with your gear in a river bag and hope that it doesn�t get soaking wet! Finally, 1.9 miles below the waterslide, the trail reaches the Escalante River. There is a good place to camp in the grove of cottonwood trees on the opposite side of the Escalante, or if you prefer you can camp on the sandbar near the confluence. But before it gets dark you should take some time to examine the base of the cliff on the northeast side of the confluence. This area appears to have been occupied by the Anasazi in prehistoric times. The base of the cliff contains many badly eroded petroglyphs, including an easily recognizable impression of two desert bighorn sheep. I also saw a broken grinding stone while I was there. The Escalante River is less wild than Death Hollow, and the 7.0-mile walk to the Boulder Highway is much more serene. Nevertheless, the Escalante has its own special beauty. Escalante Canyon is more open, with a wide, flat bottom, closed in on both sides by familiar walls of Navajo Sandstone. For 50 feet on either side of the river the ground is covered with dense thickets of tamarisk, willow, and cottonwood trees. But away from the river there are wide avenues of sagebrush covered desert. The trail avoids the river most of the time, but when the canyon narrows and the trail is forced back into the trees it is often much easier to walk right in the streambed. 4.8 miles below Death Hollow the trail passes the first major landmark along this section of the Escalante River: Escalante Natural Arch. The arch sits high on the south rim of the canyon, and is completely inaccessible from the bottom. Interestingly, there is an Anasazi cliff dwelling in an alcove just below the east side of the arch. The site faces north and would have been a very uncomfortable place to stay in the winter; nevertheless it looks as though the family that occupied the alcove was very well established. 700 years ago there were many Indians living along the Escalante. With its wide flat bottom and its reliable water supply the canyon must have been an ideal place for them to grow corn. Although there are many petroglyph sites along the river, the ruin near Escalante Arch is one of the few remaining Anasazi dwellings. Most of the inhabitants must have lived in more temporary structures on the canyon floor. The main trail continues eastward from the Escalante Arch along the north side of the river, but I suggest you pick up a lessor used trail near the Anasazi ruin on the south side of the river. This trail meets the river again 0.4 mile further downstream at the Escalante Natural Bridge, an even more impressive arch. The Natural Bridge lies in front a huge 200-foot diameter alcove that has been etched into the sandstone walls by a seep at the base of the sandstone cliff. The 15-foot-thick bridge is 200 feet high and spans across the entire width of the alcove. East of the Escalante Natural Bridge the canyon widens out as the river makes three more long meanders before reaching Calf Creek and the Boulder Highway. The trail is well defined in this area, as many day hikers walk in from the highway to see the Escalante Natural Bridge. You should reach the Escalante River Trailhead and the end of the hike after about 45 minutes. Upper Death Hollow is much different from the lower part of the canyon. In lower Death Hollow you will often be required to wade through pools of water, but they are seldom more than 3 feet deep. In the upper part of the canyon, however, the water barriers generally occur at the bottoms of deep V-shaped channels in the sandstone with sides so steep it is impossible to go around them. The slots can be up to 100 yards long, and the water in them is often too deep for wading. To make matters worse the narrow water-filled channels are frequently preceded by large chock stones that make it necessary to climb or slide down as far as 10 feet before splashing into the cold water. How to get through these water barriers? In those places where wading is impossible most people swim and float their backpacks across on air mattresses. In a few places it is possible for one person to swim through the channel and then walk back over a ledge above the water and pull the backpacks up with a 50-foot length of rope. Probably the easiest and fastest way to get through the deeper parts is to carry a river bag large enough for your entire backpack. This will allow you to float your gear through the channels and also use your pack as a floatation device to assist you in swimming. Whatever you do, the most important thing is to plan ahead and be prepared for whatever you might encounter. Three essential items are 100 feet of rope, some way of keeping your gear dry, and some kind of flotation device for your backpack. Most important, you shouldn�t attempt this hike alone. Two or three people working together will make the job of getting through the water barriers much easier, and if you get into trouble in the water someone with a rope can make all the difference. Allow 4 full days to get from the Hell�s Backbone Road to the Boulder Mail Trailhead, or longer if you intend to exit at the Escalante River Trailhead. The first part of this trail is very steep, loosing 500 feet in the first 0.3 mile. But after the initial drop it settles down to a more gradual rate of descent, finally reaching the bottom of the drainage 0.6 mile from the trailhead. From there a vague, often nonexistent trail follows the dry canyon floor for another 9.4 miles before finally coming to the first water. Within 0.3 mile after the passing the first water you will arrive at the canyon�s first serious obstacle, a waist-deep pool about 30 feet long. This pool is just a mild introduction to what lies ahead. Over the next 2.5 miles you will be forced to negotiate one watery barrier after another. The depth of the water will occasionally be over your head, but most of the time it is no more than chest deep. If you didn�t have to worry about a backpack the barriers wouldn�t really be a problem, but getting backpacks across the pools can be a difficult, time-consuming chore. 1.5 miles below the first barrier you will come to a narrow constriction where a huge chock stone has lodged, forming a 15-foot drop in the canyon floor. This particular obstacle would be enough to stop most people, but fortunately there is a way around it. If you will climb to the top of a 100-foot sandy ridge on the left side of the streambed you will see another side canyon coming in from the north. This is Right Fork, a major tributary of Death Hollow. Right Fork runs parallel to Death Hollow for a few hundred yards before intersecting the main canyon below the worrisome chock stone. By crossing the ridge into Right Fork and then walking to the confluence you can completely avoid the obstacle. I should mention that there is an extraordinarily nice campsite in Right Fork Canyon. When you drop into Right Fork you will find yourself on a broad, open veranda of flat slickrock�perfect for laying out sleeping bags and gazing at the stars. Several large water-filled potholes on the terrace support a large population of frogs, and the tiny animals seem to delight in serenading weary hikers each evening with their mournful songs of love. The next 1.0 mile below the Right Fork campsite is the most difficult segment of the Death Hollow hike. There is more water in this part of the canyon, and the water-filled slots are also longer and deeper. At least two of the pools are over 100 yards long. Again, the water is seldom more than chest-deep, and the longest swim is no more than 60 feet. As before, however, the major problem is getting backpacks across the water. Finally, about 3.0 miles above the point where the Boulder Mail Trail enters Death Hollow the character of the canyon changes dramatically. Gone are the narrow sandstone slots and stagnant water that caused so much trouble before. Instead you will find a pristine environment where the water is flowing and the canyon is filled with rich soil and lush vegetation. As you approach the Mail Trail you will come upon a hiker-made trail that makes walking much easier. Finally, 18.2 miles after leaving Hells Backbone Road you will arrive at the junction where the Mail Trail enters Death Hollow. Here you can either exit Death Hollow and walk to the Boulder Airport or continue down the canyon to the Escalante River along the route described earlier. It is easy to miss the junction with the Boulder Mail Trail if you aren�t paying attention, but if you are observant you shouldn�t have any trouble. Just stay on the well-worn path and look for another obvious trail that leaves abruptly to the left and starts climbing up the east side of the canyon. Shortly after the junction the canyon makes a hairpin turn from east to west and passes under the old telegraph wire that is strung across the canyon about 30 feet above the ground. 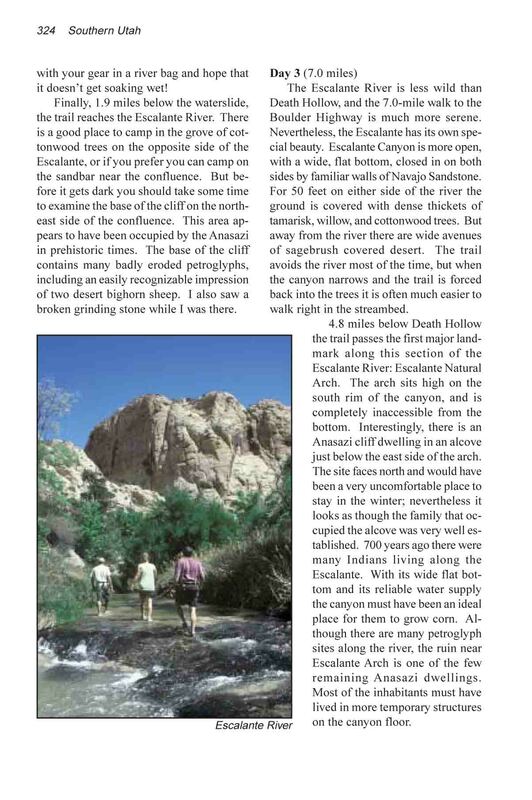 The book includes more text, more photographs, and trail maps.